Rome, we all know, wasn’t built in a day, but the city of Guthrie, Oklahoma, was. Or, to be more accurate, it was “built” in a few hours. On Monday morning, April 22nd, 1889, Guthrie was an unpopulated stretch of prairie land where coyote, wolf and deer roamed freely, but before sundown, it was a town of at least ten thousand. 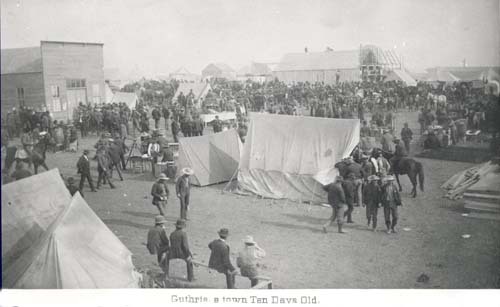 In the few hours after the cavalry bugles were blown indicating the start of the land run, streets had been laid out, town lots staked off, and steps taken toward the formation of a municipal government. That evening, the campfires of ten thousand people flickered on the grassy slopes of the Cimarron Valley. 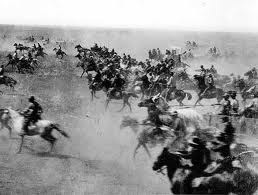 That day, nearly two million acres of land opened up to white settlement the in Unassigned Lands of the Oklahoma Territory. Initially considered unsuitable for white colonization, Oklahoma Territory was thought to be an ideal place to relocate Native Americans who were removed from their traditional lands to make way for white settlement in other states. 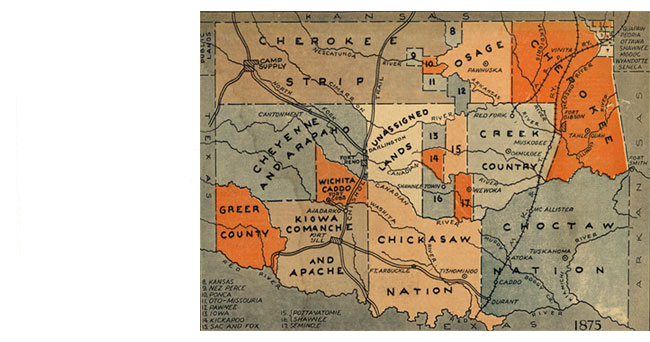 The relocations began in 1817, and by the 1880s, what is now the state of Oklahoma was home to nearly 40 tribes, including the Creek, Choctaw, Chickasaw, Cherokee, Cheyenne, Comanche, and Apache. At 11:50 a.m. on April 22nd, 1889, soldiers signaled the Boomers to form a line. When the hands of the clock reached noon, cannons boomed and bugles rang out, and the race began. With the crack of hundreds of whips and yells of a myriad voices, thousands of Boomers streamed into the territory in wagons, on horseback, penny-farthing bicycle, and on foot. It’s estimated that 50,000 to 60,000 settlers entered the territory that day. By nightfall, thousands of settlers had claimed town lots or the one of the many160-acre quarter sections of land. Towns like Norman, Oklahoma City, Kingfisher, and Guthrie sprang into being almost overnight. By the time Guthrie was only one month old, it had a hotel, general stores, three newspapers—and fifty saloons. I was born and raised in Oklahoma, and the topic of the land runs has always fascinated me. I love the scene from the movie Far and Away, where Nicole Kidman and Tom Cruise ride in the land run, so it’s probably no surprise that the first book I had published was partially centered around the 1889 land rush. Sooner or Later is still available in eBook format. Surprise! I'll give one lucky commenter a copy of The Spinster Brides of Cactus Corner. When Sarah Marshall’s wagon breaks down near a stage stop at the mouth of the Santa Fe Trail, marriage proposals fly in faster than the incessant wind, but only one man interests her—and he’s not proposing. Ethan Harper’s well-ordered life is thrown into turmoil when an uppity city gal is stranded at his family’s stage stop. Now his two brothers and every unmarried male in the county are wooing Miss Priss. When one brother proposes, Ethan is in turmoil. Is it because she’s the wrong woman for his brother Aaron—or the right one for Ethan? Haha, before I even got to the bottom of this post, I was thinking about the movie Far and Away. LOL In the movie, didn't they have to grab a flag to claim the land? Did that happen in real life? Or am I remembering it wrong? Great post, I learned a lot. Thanks for sharing and God bless. You know, the flag thing is something I've not been able to confirm. I'll keep researching though until I find out. And they did grab a flag in the movie. I thought so and it would make sense...as proof that they claimed that certain spot. I'm not a huge Tom Cruise fan, but that was a pretty good movie. Watched Far & Away about a month ago for the 2nd or 3rd time! lol Enjoyed this Vickie. That Guthrie sprang up in a day is simply amazing! I really enjoyed Far and Away. It captured the excitement of the land rush era well. Vickie that was so fun! Now I want to see that movie with Nicole and Tom and I don't ususally watch movies! Vickie, I love this amazing bit of history. Thanks so much for sharing. Those are some amazing pictures! I love these glimpses into history! Thanks for stopping by, Bethany. I think it's cool that photographers in that time period were able to capture the race so well. Vickie, That is so interesting and so is the book you are giving away. I didn't know there was a movie about the Oklahoma land rush. I enjoyed reading about the history of the Boomers and the Sooners. Thanks for entering me in the giveway for the book, "The Spinster Brides of Cactus Corner". 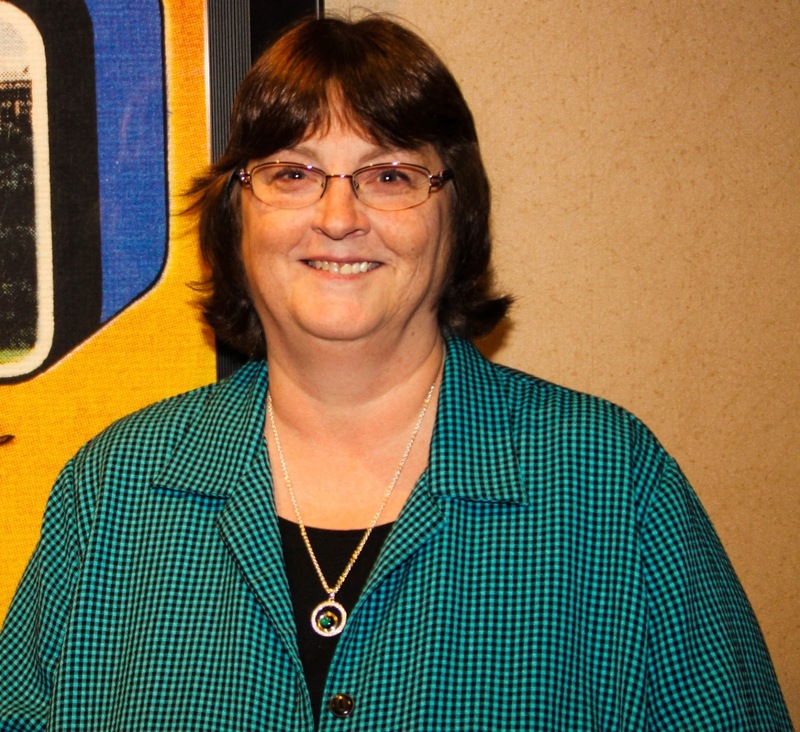 Thanks for sharing about the land run, Vickie. Now I know where those names originated. Your book looks great! I thought of Far and Away right off too! Yep, love that movie! Thanks for stopping by! Thanks, Vickie, that was incredible information. I read have the blog to my hubby sitting on the other side of the room working...lol. I will most certainly be listening for the 'Boomer Sooner' chant the next time I watch college football! I'm glad you enjoy my post about the land runs. I think it's so interesting. Great post Vickie! I loved learning more about the Land Rush. Thanks, Carrie! It's a fascinating topic. I've always wanted to write a book centered around the Cherokee Strip Land Run, especially since a member of my mother-in-law's family participated in this run. I still have photos of the old homestead and a quilt that they had with them during the run. This is a time period rich with ideas. 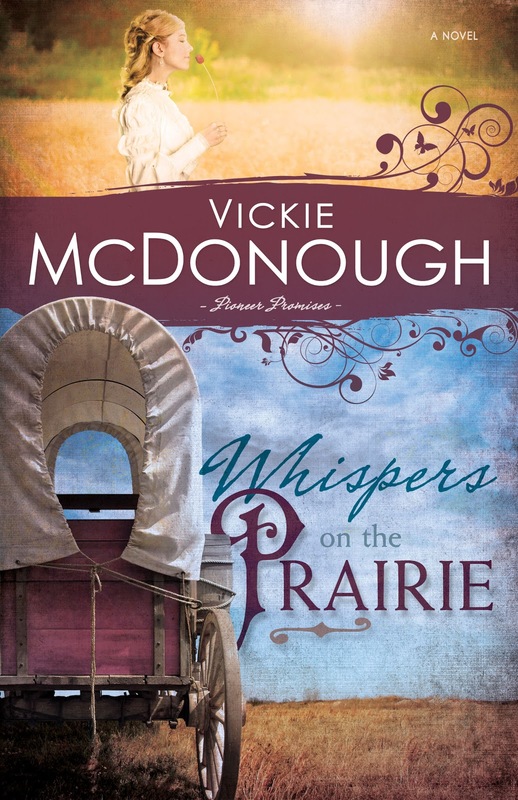 I look forward to reading your second book in this Prairie series, and enjoyed the first one too. That's so cool that you have family who participated in the land runs. I bet they had some stories to tell. I'm an OKIE from Missouri - headed to OSU for college and never looked back - until God called us to be missionaries in Central America. Now we're stuck in the land of Texas when not overseas! I would love to read this book! Thank you for your service as a missionary. And Texas isn't too bad of a place to be stuck. Vickie, I loved this post. I can't get my head around the fact that the town was built in a few hours and the beginning of a government established. Wow! Thanks for sharing this. It wasn't just one town, but several. Guthrie is a real cool town to visit if you like historical buildings. Guthrie has more building on the historic registry than any other town west of the Mississippi. I think it's fascinating too, Winnie. I imagine life was hard, though, during the early days of establishing a town. 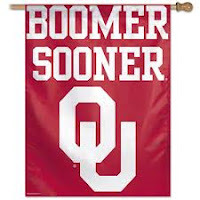 I've always wondered about what "Sooners" meant, thanks for a bit of history! Now you know, Merry. :) Go Sooners!! Thank you for sharing this history. My Mother and I love to read about history, whether it's real or fiction. Mom is the youngest of 11 children and she is researching our ancestors. It's amazing what you can learn. I grew up in Ohio and always thought of Oklahoma as "the west." Now I live in Colorado! LOL I've never heard of the movie Far and Away, but I'll look it up. I've always enjoyed reading your books, Vickie. Wo, do you still think of OK as the West? I've always thought of Texas as the West, but it's actually south of me. When you grow up in the eastern states (and my dad was from eastern Pennsylvania, so we traveled east a lot), you think of anything west of the Mississippi River as "the west." To us, the Rocky Mountains were so far away, and now I'm living there! Of course, easy air travel has shrunk our country down a bit. 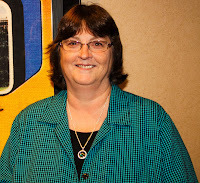 Hi Vickie, great post! 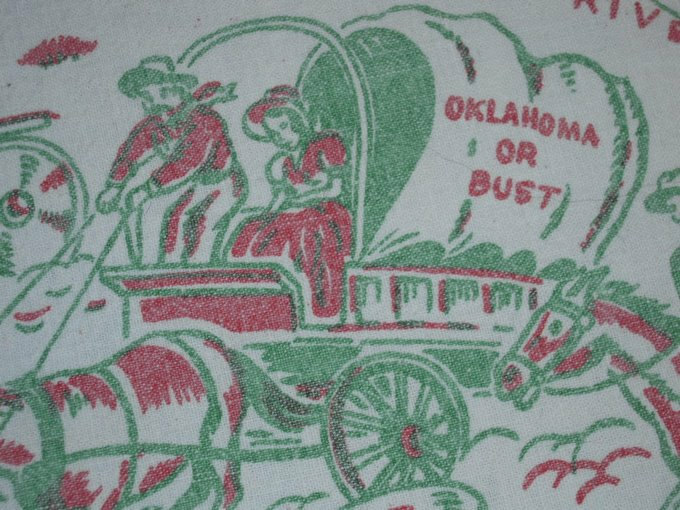 It was certainly of particular interest to me since my Love Inspired Historical next April is about that very thing--the Oklahoma Land Rush. What an amazing day in US history! Cool! I'm going to have to read that one. Forgot to say, another good movie that covers the Land Rush (and goes far beyond it) is the old movie "Cimarron" with Glen Ford. It was good to get the feeling of the era. Vickie, your post was so interesting. What a fascinating piece of history. Far and Away is one of my favorite historical movies! Yep, I agree, Kay. Very interesting history. The Land Run fascinates me too. Hubby's family participated, and settled in the Meridian area in Logan County. Wouldn't it be fun to be able to travel back in time and watch it all unfold! Thanks for the entry into the book giveaway! Talk about a historical writer's dream. I wonder if there's ever been a reenactment of the land runs. 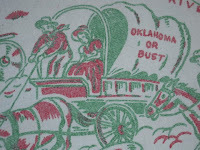 I'd heard about the Oklahoma land run but didn't know which specific cities were established. Thanks for a very informative post. Thanks also for the chance to win your new book. Great post, thank you for the chance to win your book! That was a fun post. Thanks for having the giveaway. The winner of The Spinster Brides of Cactus County is Betti. Congratulations!! Fascinating info! Think I would enjoy reading your book! I would love to read your book...thanks for the chance to win.